Bella Bella Community School Welcomes You to 2014-15! While the public schools waited for a reasonable settlement that would see teachers with a secure contract and students back in classrooms, Bella Bella Community School started school with a bang on Sept 2 and it went from there. Let me first say that I was in solidarity with the teachers of British Columbia who stood behind what they know is in the best interest of learners. I too walked the picket lines for two full weeks in 2005 and then again for three days in 2011. This year, my former district colleague has 22 children in her kindergarten class and at BBCS, this is an unheard of class size. BBCS has the privilege of small classes and dedicated support for students who require learning support. There is a teacher assistant for each classroom. There is a solid commitment to addressing the needs of our learners in classes from our school board and from FNESC (First Nations Education Steering Committee) and FNSA (First Nations Schools Association). Smaller classes allow for more individualized support. Already, we have had two professional coaches visit our school, along with a speech and language therapist and a visiting pediatrician. Our teachers had the opportunity to sit with a special education coach to ensure the needs of our children with special needs and IEPS are addressed. Our teachers had the opportunity to meet with a regional principal who works with administration to provide instructional support to teachers. Our school strives to meet the goals inherent within our mission statement. In October, a literacy coach will visit our school to ensure we are providing a rounded literacy program. Students are able to enjoy breakfast each morning at BBCS and once a month, the health center staff provides an extra special breakfast for everyone. Our students are also provided with the opportunity to grab a healthy snack at recess – usually cut up fruit. Healthy eating is a focus at BBCS. On Sept 2, our day began with a Welcome Back assembly where students had to find their teacher with help from their parents and then they got to sit together for the assembly. We then witnessed the unveiling and blessing of a Welcome Pole that was installed into our foyer. The pole was carved last year by many staff members and students each contributing in some way and it introduces a new legacy for BBCS. The Welcome Pole is intended to turn the page on the grief stemming from residential school where our children’s’ parents and/or grandparents faced the wrath of an assimilationist policy intended to eliminate all aspects of Aboriginal culture. Our chiefs played an important part in this ceremony, as did our two school elders who along with several children blessed the pole before it was installed. It is our hope that many people will visit the school to see our Welcome Pole. The weather in Sept. was spectacular; it supported several events that brought BBCS outdoors. Stream of Dreams spent a week in our school educating our children and engaging them in a series of hands on activities. 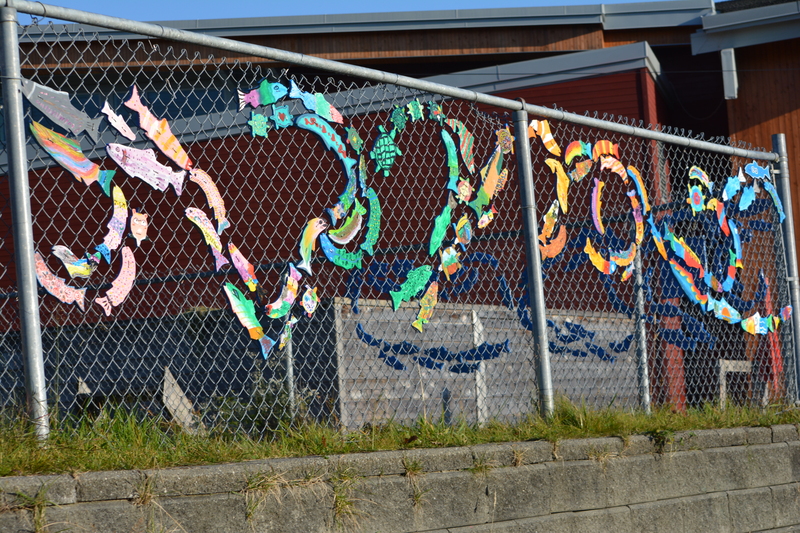 They left us with a tribute – a colourful school of painted fish plaques along the fence in front of our school. The finale for this was the Salmon Festival organized by SEAS and many staff and student volunteers from BBCS. Students helped with the preparation from getting the fire going to prepping the fish. It was an event that drew hundred of community members out to enjoy a demonstration of seine netting, drumming and singing, and many other events including a delicious bbq salmon luncheon. Several of our students went on daylong fieldtrips with our SEAS coordinator and were able to participate in land-based and locally relevant learning. Some students went to Beales or to Gulchucks and others went to the lakes at Denny Island while others went to Koeye for an overnight camp. A group of our students attended aweek-long fieldtrip with elders, community members and their teacher to attend an historic peace treaty signing with our neighbours, the Haida. They will give a presentation at our first recognition assembly on Oct 11th. Everyone is invited! In the elementary wing, several amazingly dedicated teachers hosted parents and grandparents in literacy events as an opportunity to put faces to names. These included We Read teas in several classes and a PALS event, Parents as Literacy Supporters for our K and Gr 1 students. Staff organized a meal, a presentation for parents, crafts for children, and a bag with a book and crafting tools for children to take home. The Home Ec students in grades, 8, 9, and 10 prepared a delicious spaghetti dinner for this wonderful event. In high school, our students have eagerly participated with our Wednesday afternoon clubs, which is our way of raising the fun factor at BBCS, and so far, it has been a rousing success! This is a new initiative this year and one that we are very excited about. They have enjoyed kayaking, photography, archery, among other opportunities. I have never before had to remind kids that they were dismissed as they seem content to remain at school after hours. Another highlight was the Terry Fox run which raised over $2000. for cancer research. As the principal of the school, I am proud of the effort that staff and students put forth to make this such a successful fundraiser. I am always grateful as well for the community support. BBCS staff started the school year two days earlier than students. They spent two intense days working with each other; the first was spent at Koeye where staff mingled and explored one of the most beautiful sites in Heiltsuk territory. They walked, fished, and watched for wildlife and finished the day with a traditional BBQ meal. Along the way, they had the opportunity to look at pictographs at Port John and at the once thriving abandoned town of Namu, which is situated on traditional Heiltsuk territory. The next day was a pro d-day intended to raise awareness of lateral violence with Denise Findlay. We are off to a great start. October is just around the corner and we look forward to our annual Career Fair; our first interim reports for high school students, our recognition assemblies and our annual open House. Life at BBCS often takes us beyond the school day. In October, we plan to open the gym at 8:20 am for students to get their heart rates up and put smiles on their faces before they go to class. The smiles on the faces of the children open the hearts of our staff members who work hard to create engaging learning opportunities for all children. It is a pleasure to be at the helm of such a wonderful school.